Unconditional Love God's love is unequaled mercy, tenderness, and forgiveness blended with equity and justice. Your Need of Peace The human family's joyful communion with God needs to be restored. The grace of Christ makes it possible. Freedom From Guilt The Holy Spirit awakens conscience, leading to a Saviour who leads to repenance and forgiveness. A Clear Conscience When we confess our sins, He is faithful and just to forgive and cleanse. Total Commitment In the battle with selfishness, victory comes in full surrender to God. Discovering Peace of Mind After confession and repentance, we ask God for a new personality. God forgives our sins and provides gracious strength to live a different life. Becoming a New Person The process of maturing in the Christian life. Avoiding the extremes of ignoring God's moral law and that of trying to obey it in our own unaided strength. Abiding Peace A restful life of faith allowing Christ to transform a persons thoughts and desires -- continuing maturity in Christian living. Loving and Sharing Developing and maintaining an attitude of sharing and service to others. Soaring Higher God speaks to us through the wonders of nature and even more through the Bible. Study of the Bible (in the correct manner) brings mental and spiritual vigor. The Power of Prayer How and why to pray. Prayer should speak to God as to a respected earthly friend. Conqueroring Doubt God never asks us to believe, without giving sufficient evidence on which to base our faith. Bible truth can be characterized as both simple and profound. Fullness of Joy The Christian life that is full of joy honors God and properly represents Him. 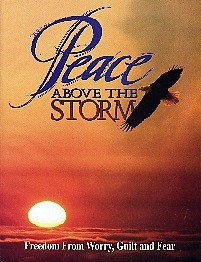 Note: The "Peace Above the Storm" magazine in printed form is 32 pages, approx. 8" x 10.7". The text of this magazine, written by Ellen G. White, was originally published by Flemming Revell under the title Steps to Christ.